Next, we have a cat that has a had a scary makeover. 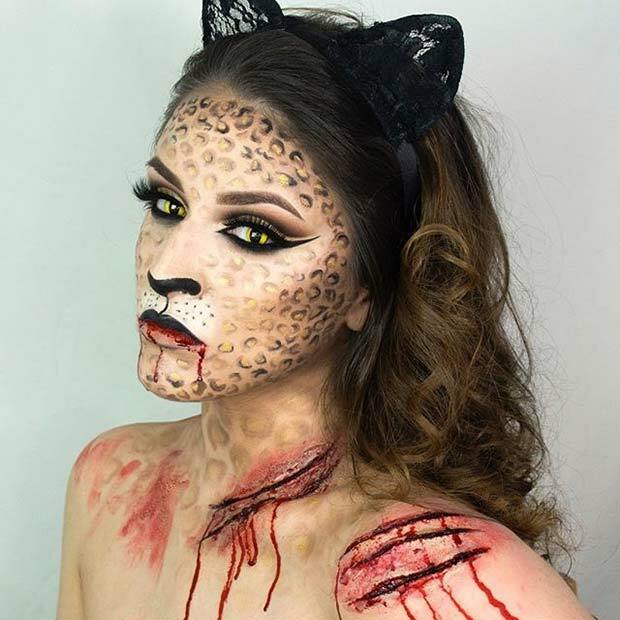 This cat makeup looks beautiful and then there is the added blood around the mouth and the claw marks. It is the perfect way to combine pretty and scary. 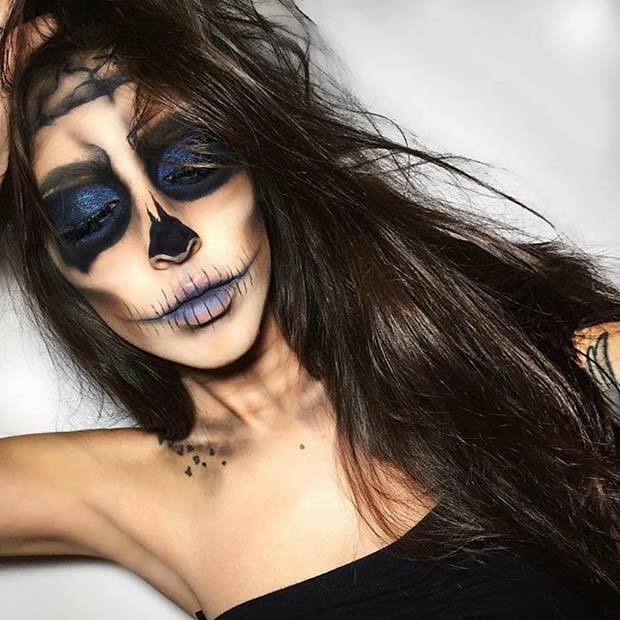 You can have stunning eye makeup with a spooky twist, we love this look. If you liked the sparkly gem skull from earlier in the post, then this pick could be for you to! This one features multi color gems to create a unique look. The makeup has a scary finishing touch with the white contacts. 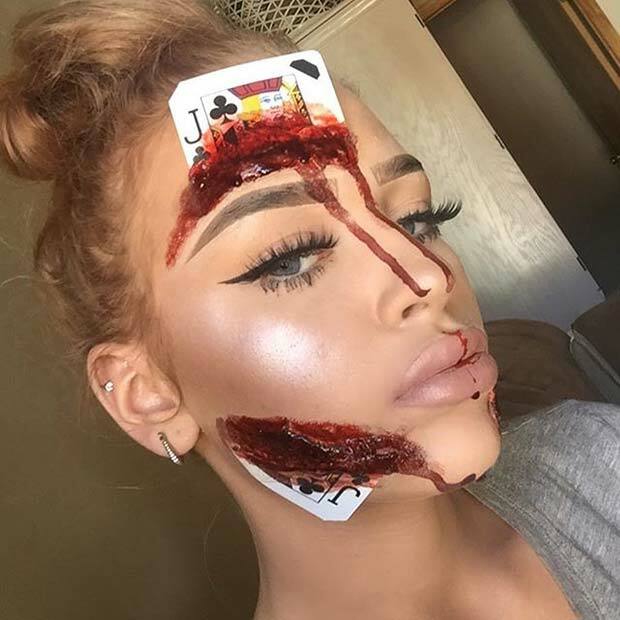 This is perfect for the girls who want to look unique for Halloween. Clowns are very scary! This next pick shows you how to create a creepy crown. There are plenty of tutorials available online so you can recreate this look yourself. You could use any color for your clown. The contacts are a must have for a frightening costume. The Nightmare Before Christmas is an iconic Halloween movie. 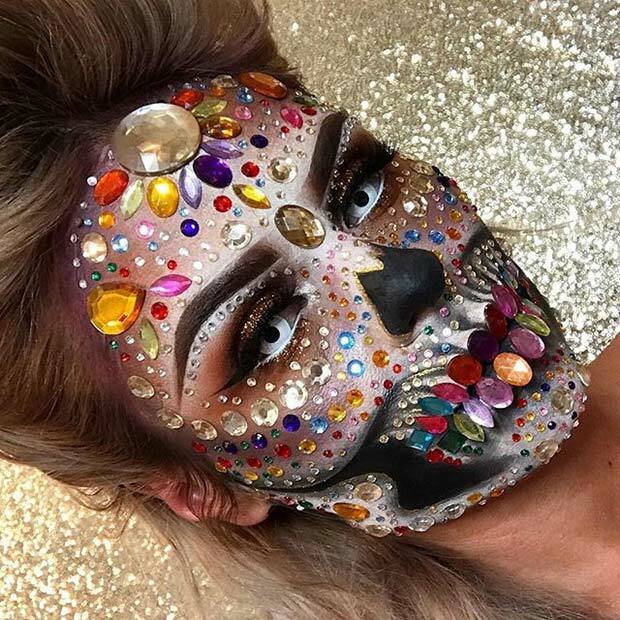 So, why not create your costume using makeup. 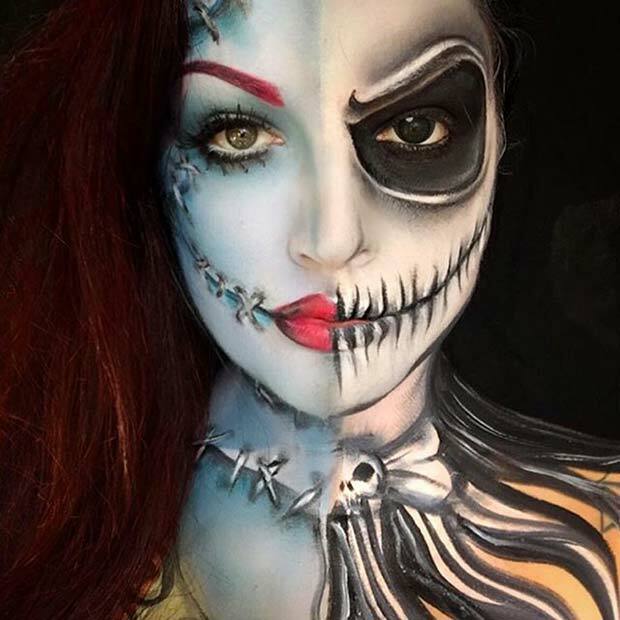 You can recreate the Jack and Sally look or just choose one of them. There are tutorials online to help you. We love this unique Halloween idea. Our next pick is terrifying! It features a face that is being lifted to reveal a scary face underneath. This would be hard to recreate but can be done with practice. 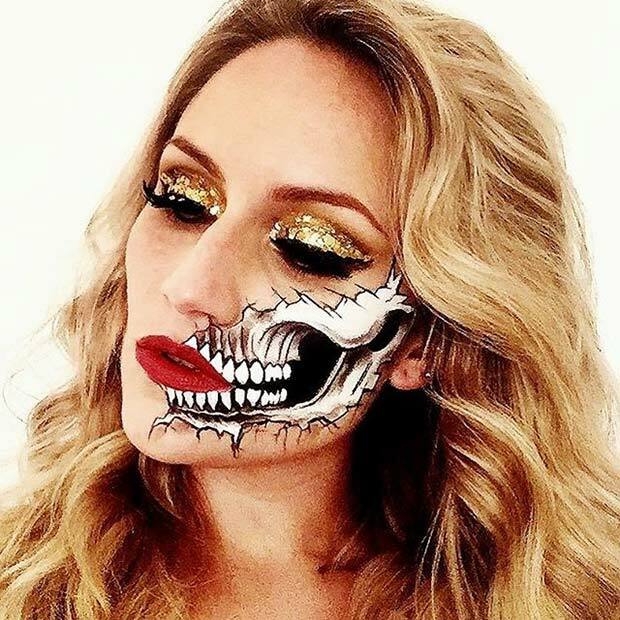 Makeup like this will frighten everyone that sees it! You could also use this as inspiration to create your own gruesome look. Next, we have a simple but gory look. It features a playing card embedded into the face. This would be great as quick makeup idea. The wound technique is great to learn as you can recreate many scary looks with wounds like these. You could also use any object instead of a playing card. Like the skull ideas? Then this next pick is for you. This skull is different to the others because it has a scary brain design. Makeup like this could be recreated simply and you can use different colors to create your own unique look. The blue tones give the makeup a creepy look. If you don’t want to go for a full skull face you could have half a face like this one. It still looks creepy but allows you to have your own eye makeup and it may be easier to recreate. 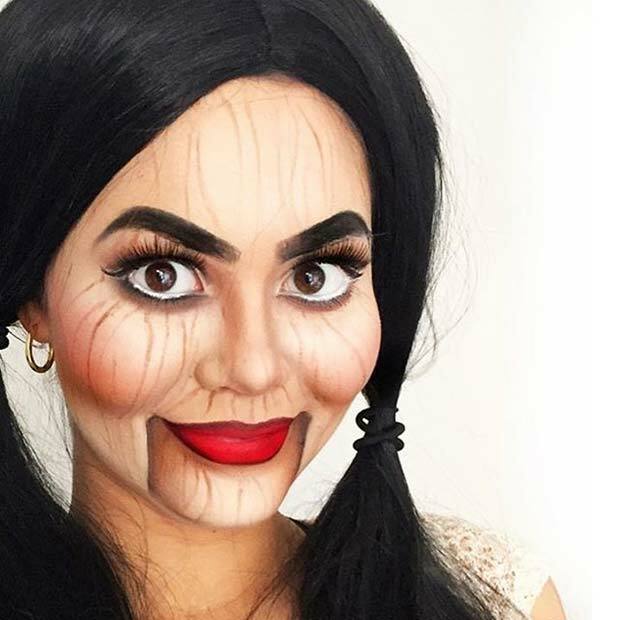 To make this look even creepier go for dark eye makeup and lipstick. Our next pick has given Little Red Riding Hood a scarier look. 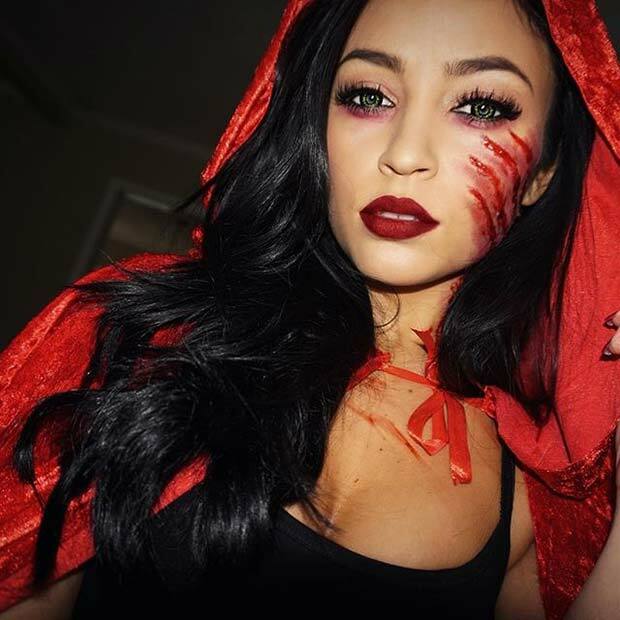 In this costume, she has been scratched by the wolf. The contact lenses give her a wolf look to like she is turning into one. This is a creative twist on the classic story. 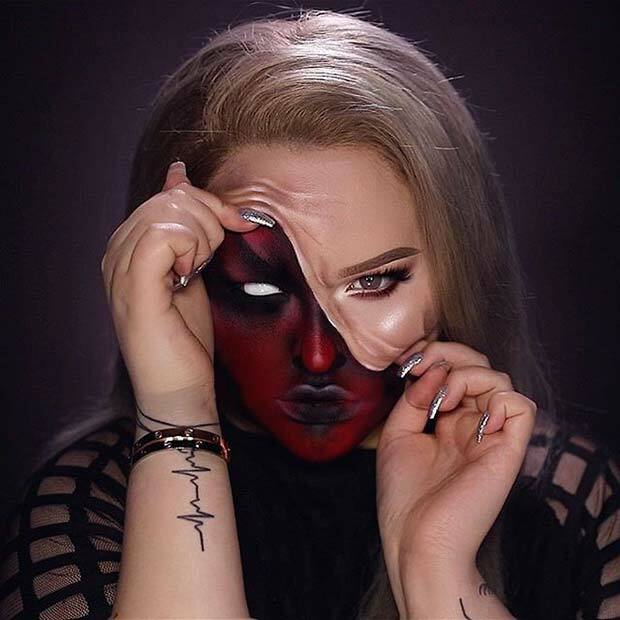 We love this simple Halloween look. If you liked the creepy doll from earlier in the post, then you might like this one to. This makeup looks like a scary ventriloquist’s dummy. Those dummies frighten most people, so it would be the perfect choice for a Halloween party. You could easily recreate something like this. Last on our list is another sparkly skull design. This one looks creepy because of the detailed teeth. 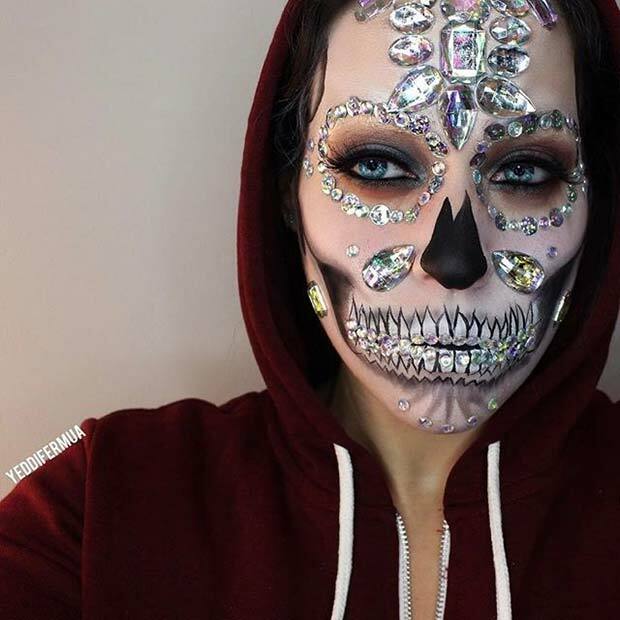 Makeup like this is perfect for the girls who want to look scary and sparkly. You could recreate this look with lots of gems like this or with just a few. 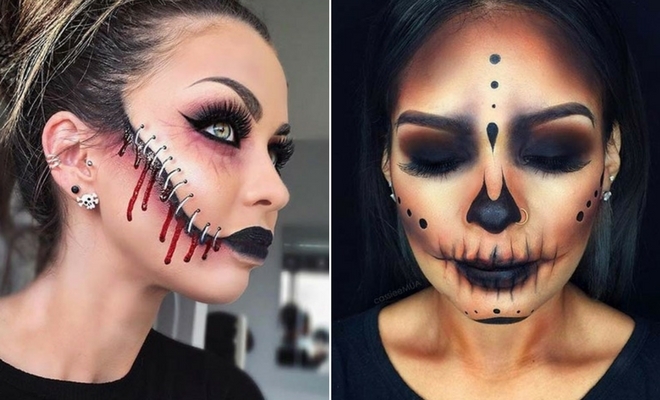 We hope you have been inspired by our creepy Halloween makeup ideas. This is really cute but not scary at all… The scariest part is spiders in hair ! Hi. I was just wondering if you could do my make-up for 27th Halloween look. An do you do call outs i tryed to find you on Facebook to send you pic on what i want doing an how much it will cost me where about you?